You are here: Home » Typealyzer – What Type is Your Blog? I came across an interesting site this morning. Typealyzer.com sets out to analyze a blog based on the content and determines the personality type of the blog. the details of life and are careful about getting the facts right. I am not sure if that is flattering or demeaning but I tend to take things positively. Even though the title seems a little discouraging, the details are more friendly and some of it even true. I do like to work in my own pace – I feel no urge or desire to post for the sake of posting everyday or to some schedule. Of course, you know that as a regular reader. One little secret I’d let you in is that actually I like reading others work more than I do writing. This results in me devouring a lot of stuff from the web but only writing about a select few that I really feel excited about here. I hope this shows in my writing than just being ‘dutiful fulfiller’. There isn’t a lot of information about the site (no About page for starters) in the home page. But, the site does have an active Google Group for Typealyzer. Reading through a few posts reveal that Typealyzer only analyzes the text directly on the url provided. So, I could have been really dynamic this whole year but Typealyzer determines the blog type by just the 10 posts in my home page. So, try putting different pages of your site url to see what you get. For eg, search results page or archives page, etc. Alternately, my wife’s Indian recipes blog SpicyTasty.com came out as ESFP – The Performers – the entertaining and friendly blog. 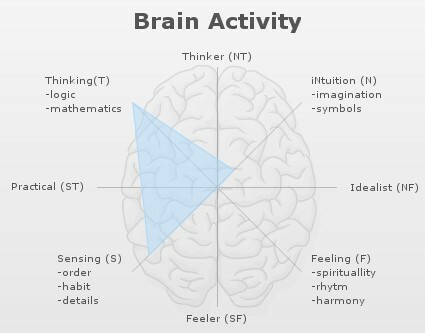 Our iPhone blog TopiPhoneResource.com came out as ESTP – The Doers – the active and play-ful type. Let us know in the comments what type of blog is yours. That is really interesting. I am going to go over now and have them look at my blogs to see if they get the same results for all. I write all myself so they should be the same don’t you think. My question is why do they do this. What do they get out of telling me what kind of a writer I am. Anyway, thanks for turning me onto this. I am a mechanic for one blog and a visionary for the second blog on the same topic. I am a duty fulfiller for the third blog and a doer for the fourth blog which is the same topic as the third. I guess they are just pulling these classifications out of a hat but they are probably getting good traffic because I saw this site mentioned on another blog today. I am “The Mechanics” too … but after reading Andy’s comment above, I’m not too sure exactly what to make of it. Cool way to pass 5 minutes anyway … thanks. I, too am a mechanic for my main blog. I only tried that one, but I’ll bet my others will come out different-any bets? Anyway hopefully the results aren’t just random (I guess putting the same blog in again might disprove that? Or not. I like the post and site, I think I’ll do a post on it too with a link back to where I heard about it of course. Great writing tips. Brilliant even. Is that the personality of the blog or blogger, I wonder what happens with multi writer blogs? They should fix the typo on their homepage (self-percieved) but their website is fun! It reminds me of a site that RT wrote about that evaluates the “education level” required to read ones website. I think I scored a college level. Anyway, very nice. Thanks. This is a pretty cool thing. Thanks for showing it. I will try to try it out. Let’s not make the same mistake with blogs as we did with resumes, try to automate the art of human interpretation! Cool tool. My DTV converter blog got: ESTJ the guardians. What’s really funny is that the character traits it applies to the site actually apply to me as a person also. Have been enjoying your e-zine for a few months now. That’s quite a cool little tool – I wouldn’t use it to determine any real important stuff, but it does come back with saying my blog is ENTJ – The Executives. Most of what it says is fair, but then again a lot of it is perhaps like horoscopes and how people interpret what it says and applies it to themselves? Would be interesting to see how they calculate that! I run some blogs,their content differs greatly from each other,so do the results. Games,fun,entertainments are to cater on the crowd, developing, self-improvement are for personal satisfaction. i got ESTJ – The Guardians. Well in my case is weird, cause in my blogs i have all organized, they are right, but my life isnt organized, i dont have an agenda. Hmm, this isn’t really reflective of my personality traits. I am way different then this! This is cool! I tried it out on my Adventurous Wench blog and got “ESTP – The Doers. The active and playful type.” I’m not sure what all the other options were, but this write-up seems like a good fit to me! Deannas last blog post..Costa Rica coffee growers bail out Starbucks? Hey Deanna, glad you liked it! It was a fun one to try and I am waiting to see what kind of developments they make as the technology behind this promises lot more as they get to process more data. Thanks for sharing this on Twitter with your friends. Yes, it does make you wonder if there is anything valid, or if it is a random assignment of types. Interesting concept, though. I have studied this method before to analyze personality, it takes long time and lots of questionnaires. I’ve got three blogs on completely different subjects and I’m a guardian for all three. Guess they’ve got my number!